A collaborative event with artists and local people will be held to improve local migration and to pass on the local culture to the future. Yanaka, located in the northwest of Ueno Park, is known as Teramachi (temple town). It is also home to many galleries and has long cultivated young artists in an environment where contemporary art can be enjoyed on a daily basis. 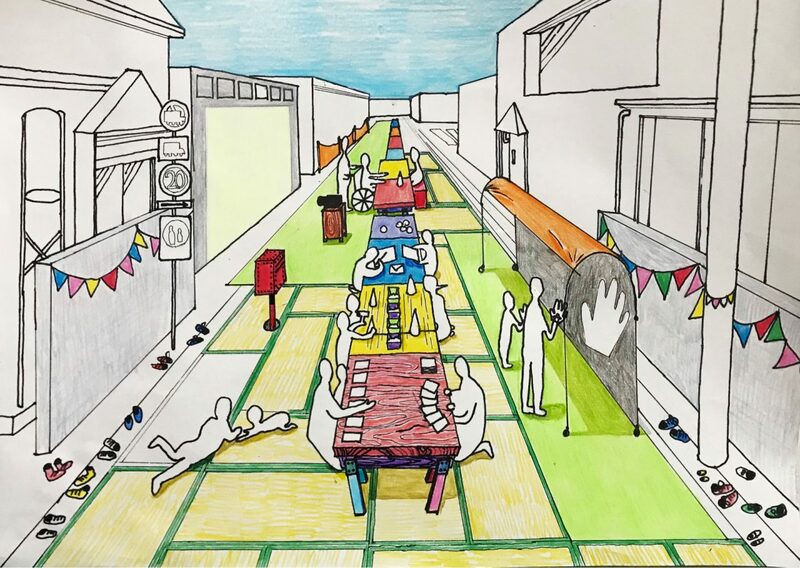 UENOYES will set up a project aimed to create a temporary space named “Yanaka Kaiho-ku” (Yanaka Liberated District), which will help to unleash people and their minds through the power of art. 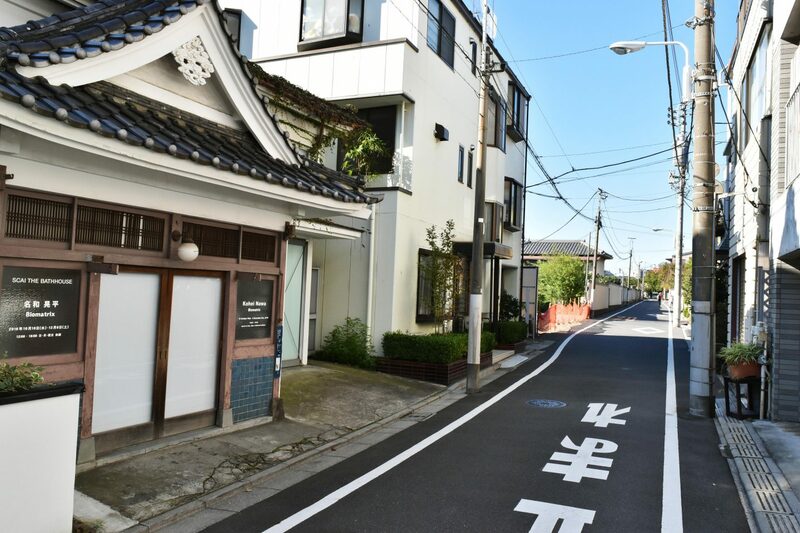 The street in front of SCAI THE BATHHOUSE, a contemporary art gallery and former bathhouse called “Kashiwayu” will be named “Kashiwayu Street” for one day on Sunday, November 25. It will be closed to traffic, becoming a pedestrian zone for artistic inspiration. Artists will take initiatives to color the street with art through interactive workshops, flash mob dances, music performances, etc. Visitors will be able to find their own ways to enjoy art by either watching or participating. For this one day only, Kashiwayu Street will have a liberated arts zone created through the participation of individuals who will unleash and share their artistic and cultural time together. *This street will be temporarily called “Kashiwayu-dori (street)” for this project, taken from the original name of the bathhouse, a local landmark, on the street. Dancer, born in 1985. Since completing his studies at the Department of Intermedia Art at Tokyo University of the Arts, he has been based in the Yanaka neighborhood in Tokyo. As a performer, he is always in pursuit of the excitement that comes with coming into contact with the charm of the area, people, and customs. His dance performances are based on the theme of wind. In 2014, he established Kaze-Asobi (literally “wind play”) Lab. As a joint production with others, he created a participatory performance called the O Dance Project, held at Komone Fukushien in Itabashi. Raised in Kakogawa City, Hyogo. He began his music career as a jazz drummer, and made his base in Tokyo in 2011. He currently performs in both Tokyo and Kansai, and leads the 11-member dance band, the Yoshinori Shiraishi Ballroom Orchestra, in Kansai. In Tokyo, he continues to perform alongside musicians from home and abroad, regardless of genre, and has given acoustic impromptu performances with filmmakers and physical expression. Graduated from the Tokyo University of the Arts Graduate School of Fine Arts with a degree in Oil Painting. While cultivating human resources involved in art, he exhibits his own work, centering on art festivals. He also regularly holds art-themed workshops. He works on a variety of content, including things that have allowed his own work to flourish, as well as things that bring him into contact with nature in the area and deepen his interactions with it as he creates. He has participated in the Echigo-Tsumari Art Triennale (2006, 2016), the 2007 Kobe Biennale, the Setouchi Triennale (2010, 2016), and the 2017 Naka-Boso International Art Festival, Ichihara Art x Mix. Graduated in 1991 from the Department of Scenography, Display and Fashion Design at Musashino Art University’s College of Art and Design, then completed the Audio-Visual Media Programme at the Academy of Media Arts Cologne in 1996. In extension of our daily lives, we can be reminded of important things, and become lost in thought at unexpected moments. Creating spaces that evoke this idea, Mukai carries out projects that integrate and treat the entire area as one, including using images to stage spaces such as historical and cultural sites, as well as workshop planning. In addition to visual exhibition design for art and science museums, she has worked alongside experts in other fields as well, including musicians and performers. Graduated from Musashino Art University’s Department of Industrial, Interior and Craft Design. He mainly creates using the self and light as a medium, and is mostly involved in contract work, producing artwork, modeled objects for inside and outside shops, designing displays, etc. He is working on many pieces that manifest the blessing of sunlight—something you seem to be able to see normally but do not, something that exists as a matter of fact, yet you don’t notice. His connection with Yanaka is also deep, having begun with his Sunny Face Project at art-Link Ueno-Yanaka in 2006. Tap dancer. Began with street dancing in high school, then entered the world of tap dance. He continues to produce one-man performances as a solo tap dancer, as well as collaborate with various artists. A baritone saxophonist who also composes and arranges music. Since his debut at 17 at the Pit Inn in Shinjuku, he has been performing as part of a trio with his parents, TReS, as well as Tokyo Chutei Iki and Shibusashirazu Orchestra. After studying under Ronnie Cuber and James Carter in New York in 2017, he returned to Japan to form his own ensemble, Shikanju. He has performed with Yosuke Yamashita, Carmen Maki, Ryudo Uzaki, kenken, BiSH, Koichi Sato, and Eita.